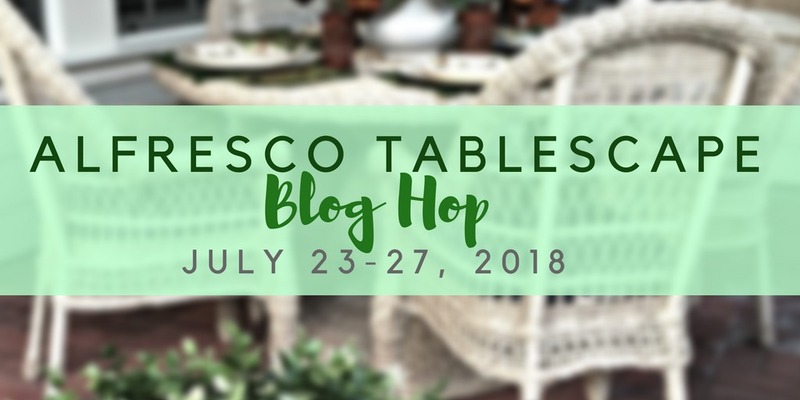 Chloe Crabtree from Celebrate and Decorate is sponsoring another tablescape bloghop this week. The first tablescape hop I participated in was the Alfresco Tablescape hop in 2016. Bloghops are like being with old friends and also making new friends as some have participated from the beginning and others are new to the group. 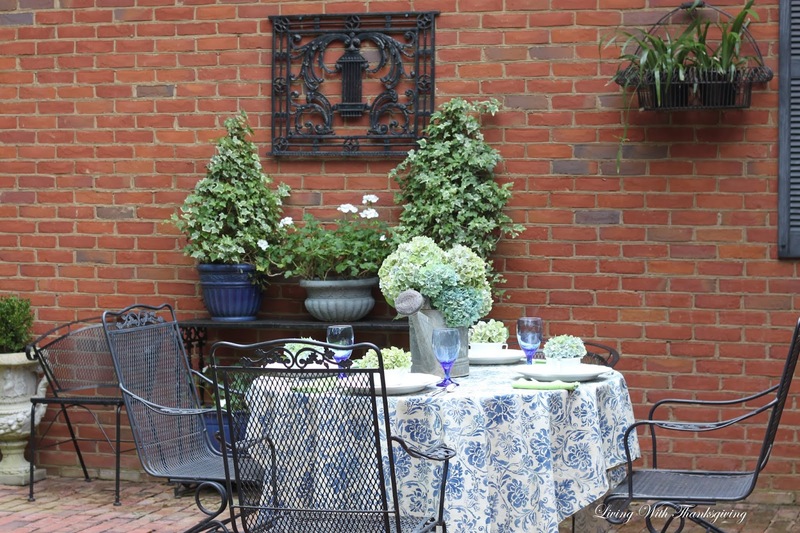 Join me for a summertime alfresco evening here in the deep south. I'm on my patio on an overcast day with a nice breeze, perfect for alfresco dining. I've cut flowers from my garden just for you. In July, the blue hydrangeas begin to turn beautiful shades of blue-green, lime green kissed with pink tips and shades of lavender. My vintage watering can became my centerpiece for this tablescape. I like to mix both formal and rustic elements in a tablescape. To me, the justaposition of mingling sterling flatware with the vintage zinc watering can add unexpected interest. Each place setting has it's own individual bouquet to make guests feel special. I'm hoping the blossoms will dry right in the container and retain their pretty colors. Blue and green are cool colors that soothe and make us think cooler in the July weather. Don't you love this sweet blue green blossom? 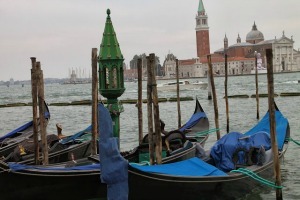 The smokey lavender and green hues in this pic have charm too. I also love the contrast of texture and shape of the plate and charger here. 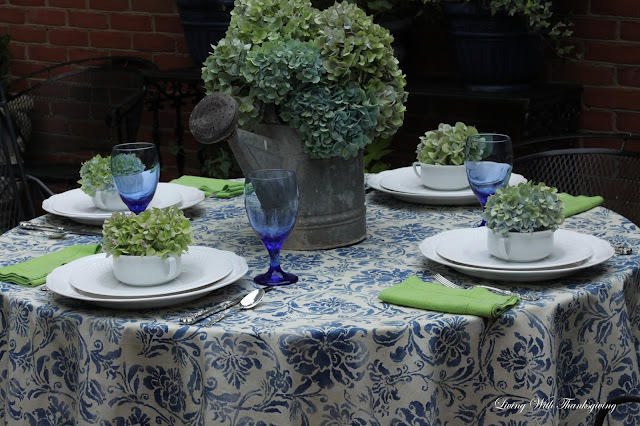 The chartreuse linen napkins add a surprise pop of color with the blue glasses and predominately blue flower print cloth. Do you feel relaxed and ready for nice conversation and a great meal? What would be a good menu? 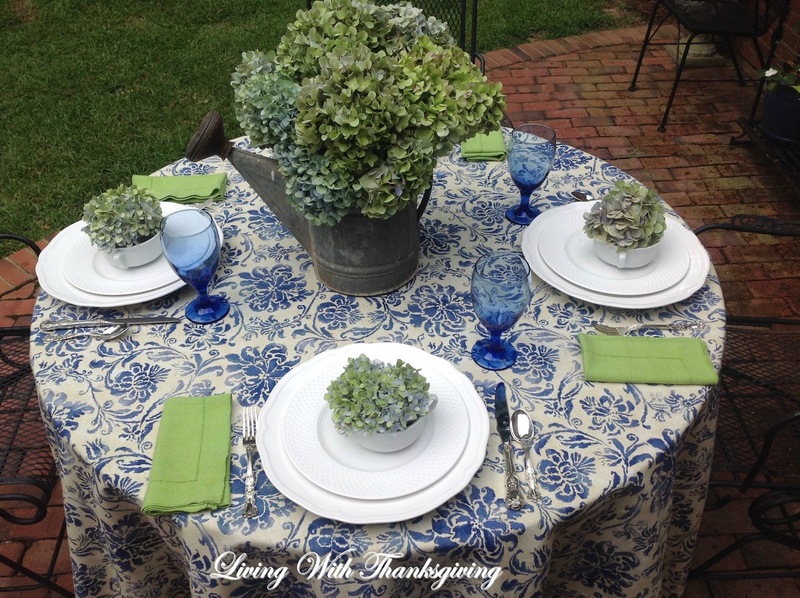 I used this tablecloth in a fall tablescape here. We use our porch and patio everyday! Are you planning any Alfresco dining this summer? Beautiful, Connie! Love blue & green palette, and your hydrangea blossoms are perfect! 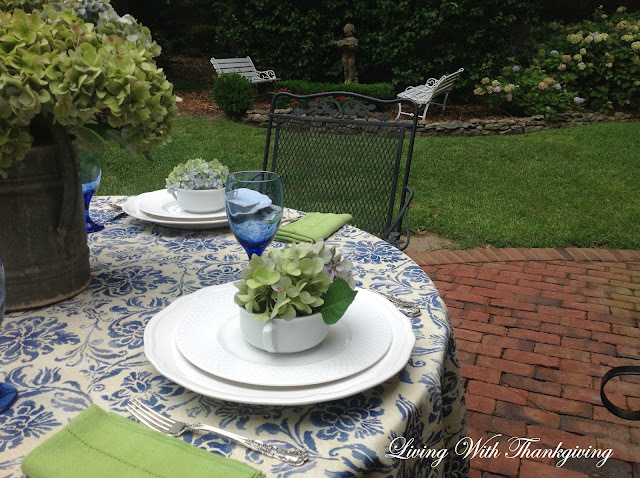 Your alfresco dining table is one of my all time favorites.You are so right about green and blue being soothing colors in the heat of July. Here in North Carolina it has been one hot and dry summer. Finally this week we are getting some relief with showers and cooler temps. 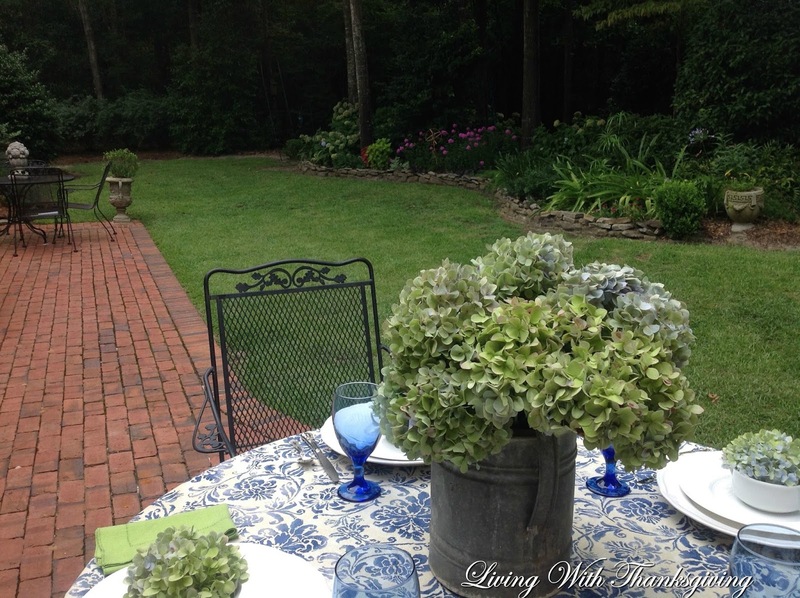 Bonnie, what a beautiful table with the changing colors of hydrangeas in your zinc watering can. The individual bouquets at each place setting always makes a guest feel special. The charming tablecloth with the pop of the napkin pairs perfectly with the changing shades of hydrangeas. And, the blue/green tabletop does make me feel cooler just admiring it. I always enjoy blog hopping with you! We love having meals on our veranda, as long as it isn't too hot. Recently, we've had a break from the heat and dining outside is enjoyable again. I'm using hydrangea blooms on my table too! Bonnie, what a lovely table. I so love your hydrangeas and in the watering can is such a creative thought. I, too, love the change of colors in hydrangeas, they certainly give us a great deal during their growing season. And, for each guest to enjoy their own bouquet is such a touch of thoughtfulness. 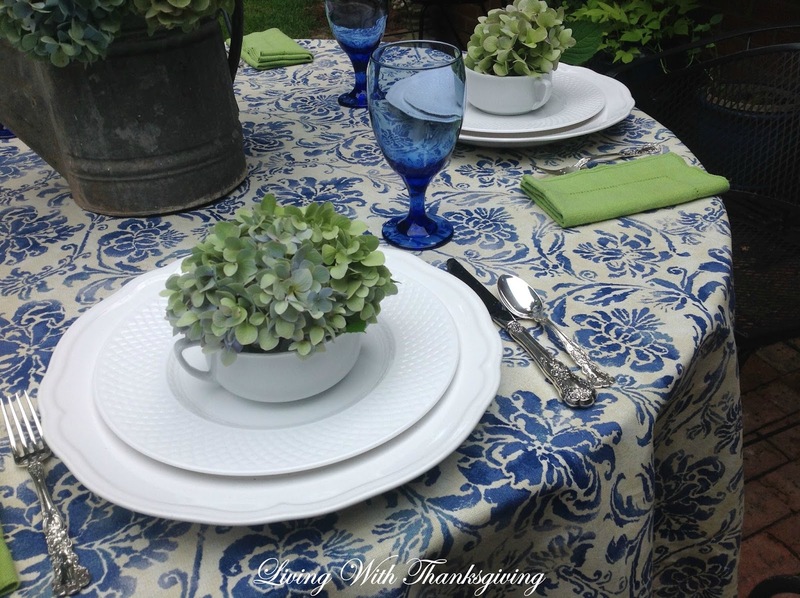 Your choice of dishes and flatware are perfect with your linens and blue goblets. It would be a special treat to be a guest at your lovely table and enjoy anything you would serve. Have a lovely week! Bonnie, I have so enjoyed your table this morning. Your pairing of the blue and white cloth with green napkins is beautiful. The hydrangeas are so perfectly beautiful...a refreshing table. I agree that your formal flatware with the zinc watering can makes for interest. Beautiful post. Your table is absolutely beautiful! I love the way you have mimicked nature with the same color pallet that is in your gorgeous hydrangeas. That soft green and blue is just so soothing, who wouldn't love sitting at this table?! You summed up the blog hops perfectly, I do feel like I am getting together with good friends again each one of these hops. It was such a treat to meet so many of our "hoppers" in person at Haven this year. I certainly appreciate all of you, but isn't it fun to have been along from the beginning? 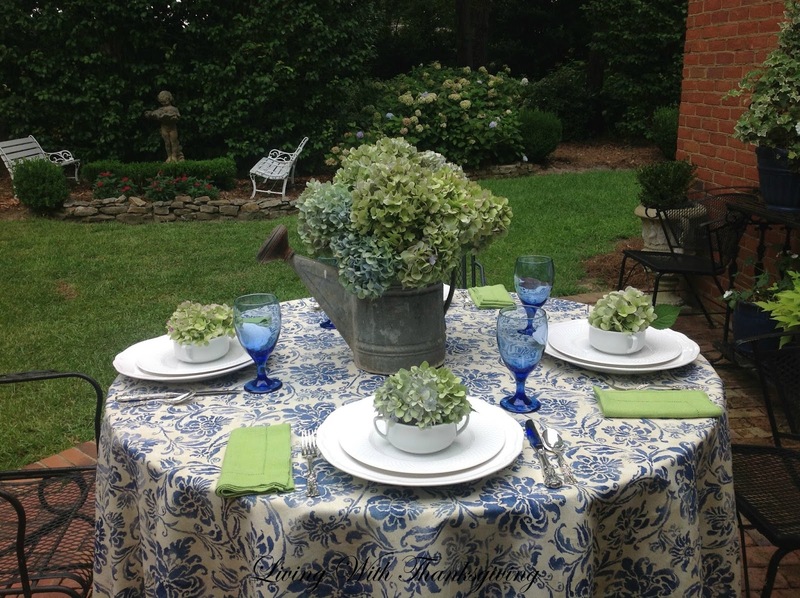 Now, your beautiful table...I love the use of the hydrangeas, especially the single blossoms at each place setting. I am so envious of the lovely location you have in your garden for styling your outdoor tables, it is like you are in a pretty park! Thank you again for joining me on on more hop1 . So gorgeous Bonnie! 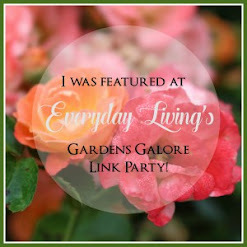 Your hydrangeas are breathtaking, and I love the way you described the way they change colors and begin to fade...the blues and greens are just so so pretty, and your vintage watering can is perfect for your garden setting. Your table is truly beautiful! Bonnie, everything looks absolutely stunning! I adore blue and green together. 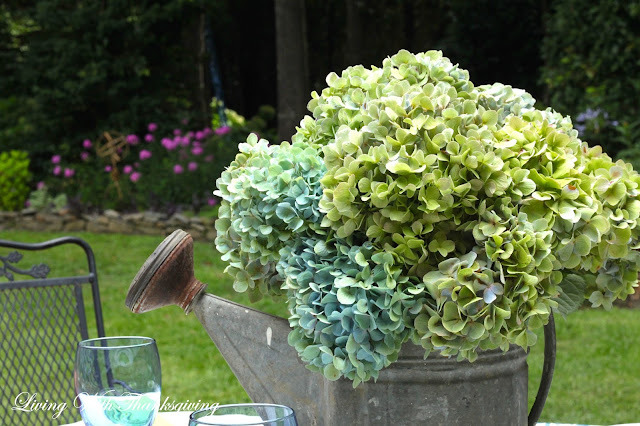 Your vintage watering can with the pretty hydrangeas makes a perfect and beautiful centerpiece. I am envious of your beautiful hydrangeas! We have planted several, but they are still small and yield only a few buds. I guess it just takes time and patience. It is always so much fun blog hopping with you. Enjoy your day, sweet friend!!! 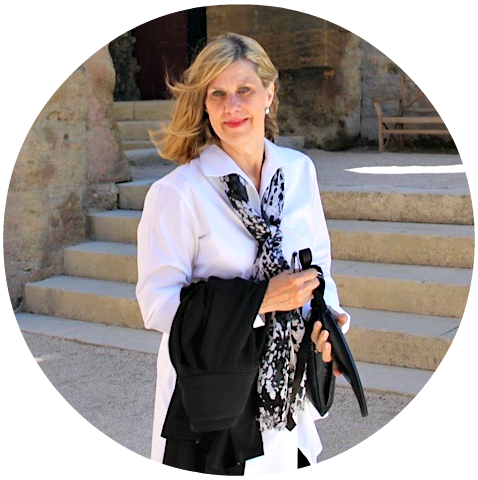 Bonnie, I feel relaxed and ready for conversation every time I enter your blog posts. 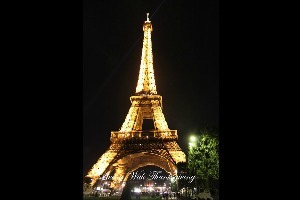 You just have that certain je ne sais quoi that makes me want to know you better. 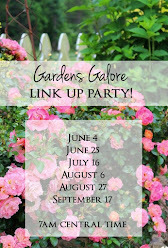 And getting to know you through this blog hop series is how it began! Your patio setting is very inviting, and you can make the heat of AL look perfectly tame and cool - how do you do that?! I love the cool colors. Our courtyard is used most every day also, but the heat definitely absorbs into our brick from southern exposure. We could not only take our meals outside, but we could probably cook them out there on the brick! Lucky for us, this week we have a break in temps. Bonnie, you always amaze me with your lovely tablescapes. Hydrangeas are a favorite and I do not have enough! Love your pretty blues and greens. So serene and peaceful. 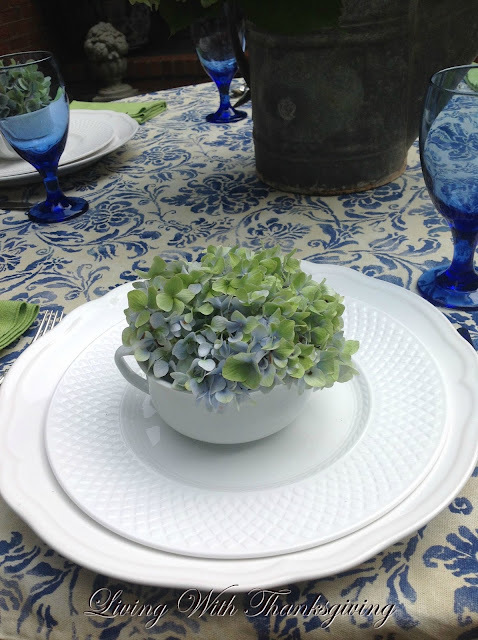 The handled bowls are so pretty with hydrangeas tucked in nicely. Always a pleasure to join you on these blog hops. How sweet is this! 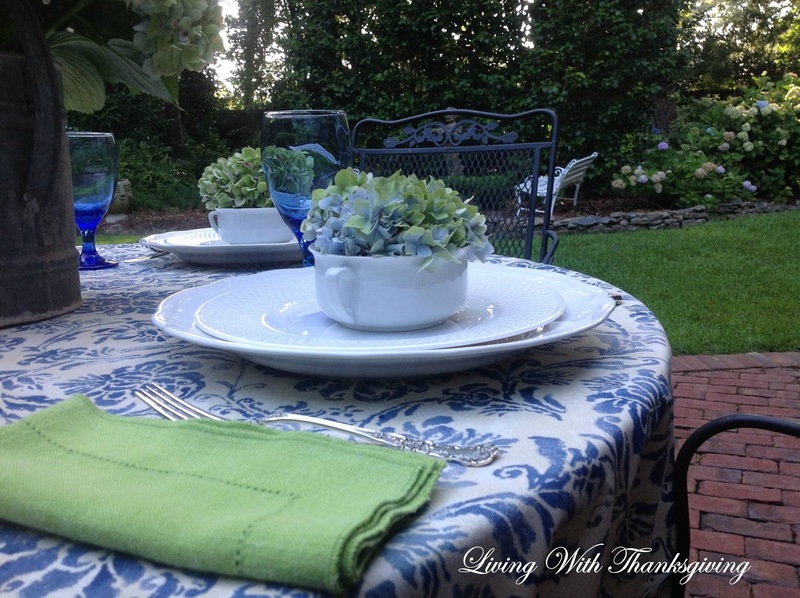 The watering pitcher as a centerpiece and those gorgeous hydrangeas at each place setting. I love it! The watering can filled with hydrangeas is right up my alley! The greens and blues are a perfect color combination. So calming and relaxing. So very lovely my friend! That's one of the loveliest tables I've ever seen. Your hydrangeas are gorgeous and I hope they dry exactly that way. Which reminds me, time to cut some of mine to dry too! Beautiful Bonnie! I am a wee bit envious of your gorgeous hydrangeas! Mine are all on the small side this year. The chartreuse napkins really pop off that pretty tablecloth. I can imagine spending breezy evenings lingering around this pretty table! 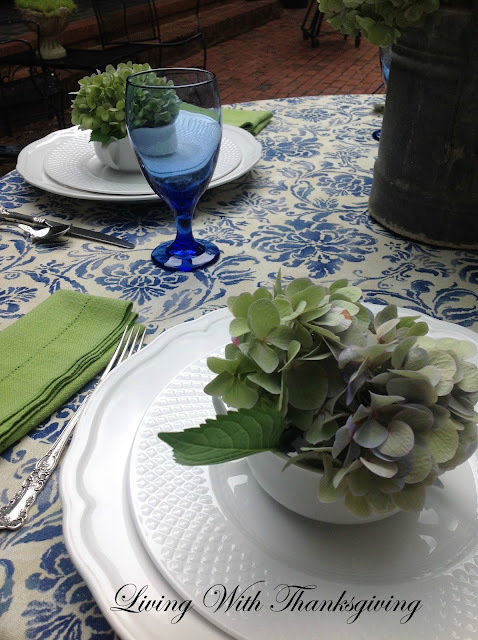 So pretty Bonnie...hydrangeas are so versatile and your tablescape has captured the heart of these beautiful flowers. I love the way your table makes me feel...like a cool summer breeze. Two of my favorite colors are mixing blues and greens...and your mix brings back memories of my first decorated room using these two colors. thanks for the memories and I always enjoy blog hopping with you. 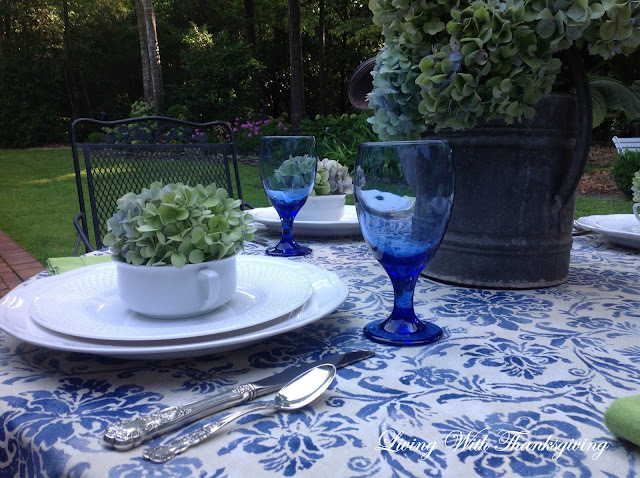 Bonnie, your hydrangeas are so beautiful and the color is the perfect focal point for your pretty blue tablecloth and glasses. What a pretty setting. It looks cool with the blues, but I know it's hot. Simple, sophisticated and so so lovely. I'd love to have a meal there with you! Oh Bonnie, it all looks so cool and restful for the end of July. Have you had really hot temps there? Our summer has actually been much cooler than last year (no complaints). :) Your hydrangeas are just beautiful; they're a flower I never tire of seeing. I love your choice of blue and white tablecloth and solid white dishes -- another cooling effect. Your flatware is beautiful and so are the blue glasses. Your patio looks wonderfully relaxing and I would love to join you for a meal there. Thanks for sharing with us and have a great week! This is certainly one lovely and sweet tablescape. Your hydrangeas are gorgeous and I hope they dry exactly that way. Hydrangeas are one of my favorite flowers and I try so hard to grow them in our brutal Texas weather. Everything is so serene and peaceful. The handled bowls are so pretty with these sweet hydrangeas tucked in them. 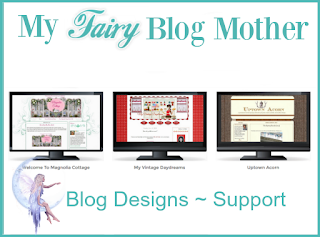 Always a pleasure to blog hop with you! I always love your al fresco tables, Bonnie! 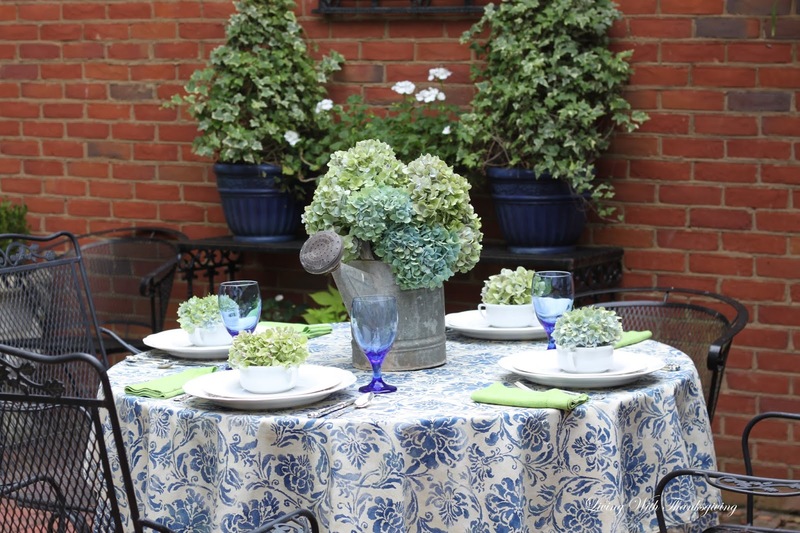 Aren't your hydrangeas the most beautiful, cool, calm addition to your table?! The chartreuse napkins were the perfect choice against the blue and white tablecloth. Using your zinc watering can was a wonderful centerpiece. I wish I could dine with you on your patio. 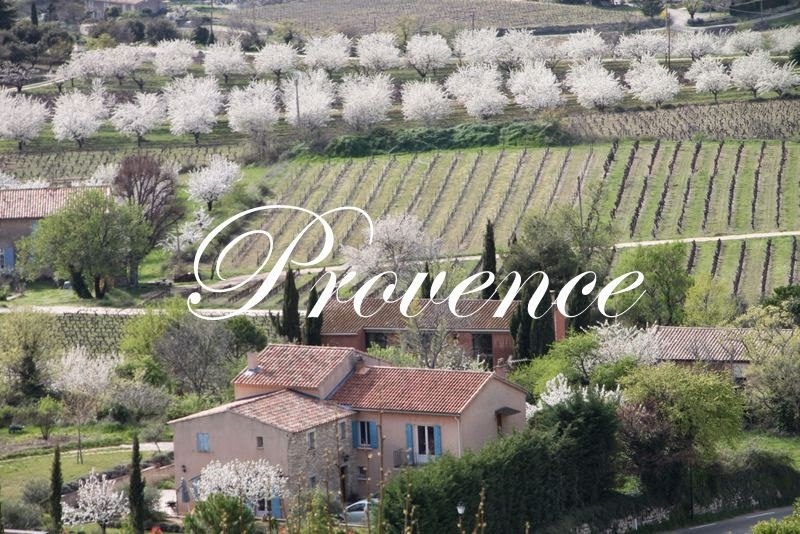 What a beautiful and idyllic setting. The hydrangeas really help add texture and oomph to the space. Cheers! 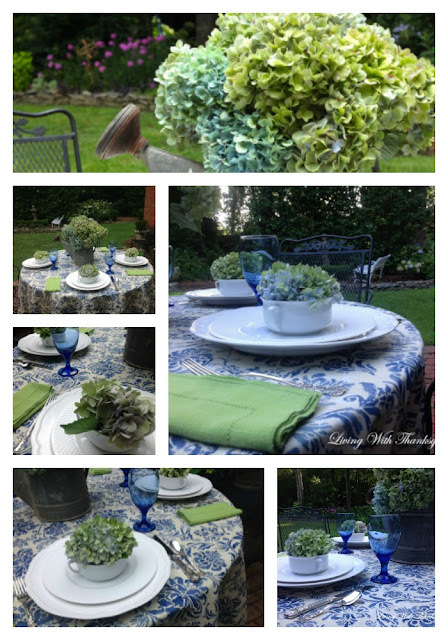 Beautiful table with your hydrangeas making a stunning centerpiece. Love the softness they bring to the table. Bonnie, your alfresco setting is summer perfect. I love the touch of hydrangeas at each placesetting, and all of this is so pretty against the backdrop of the red brick. I want to dine here tonight! Bonnie, what a wonderful color palette, so cool and lovely for a summer table. Such beautiful flowers in a delightful garden setting. My sweet friend you have gathered all of my favorite colors in this glorious tablescape. I hope you are enjoying all of summers delicious offerings. 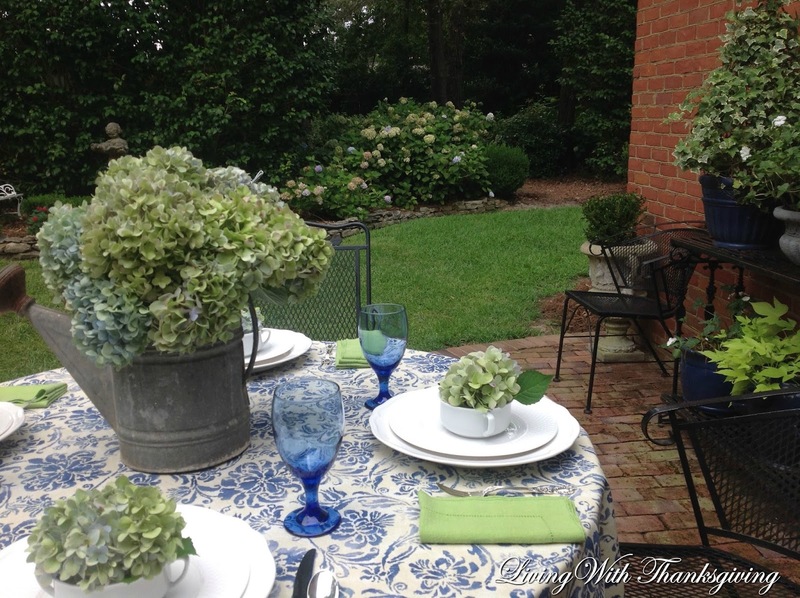 Bonnie, I am obsessed with your gorgeous hydrangeas and beautiful Summer Tablescape. I hope the hydrangeas dry just as lovely!